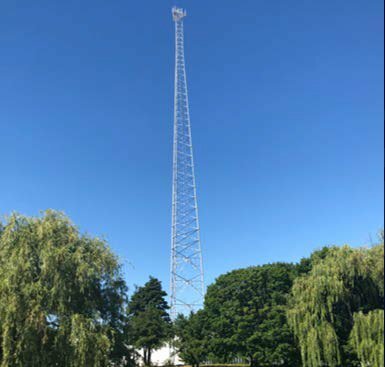 Data center real estate investment trust CyrusOne has added a new telecommunications tower to its Aurora campus in Chicago, Illinois. The 350ft (107m) tower will support microwave and millimeter wireless antenna colocation when it goes live in the fourth quarter of 2018, with high-frequency traders able to place their own antennas on the mast, reducing latency by crucial milliseconds. One of the buildings on campus, codenamed Aurora I, houses the servers of the Chicago Mercantile Exchange Group (CME Group), operator of several large derivatives and futures exchanges. CME used to own the data center until 2016, when it was sold to CyrusOne for $130 million. The campus is also home to the 50MW, 428,000 square foot (39,800 sq m) Aurora II facility. “As a leader in interconnection, CyrusOne is excited to offer this innovative wireless access solution for trading futures and options across all asset classes on the premier financial industry data center campus, and to do so in a manner that provides open and equal access to all of our customers,” Robert Crespi, VP of products at CyrusOne, said. The project, constructed by SBA Communications, was not without controversy. CyrusOne sued Aurora's mayor and council members in federal court in early January, after the council approved a proposal by Scientel to build a competing tower nearby - with CyrusOne claiming it had secured exclusive rights. "Construction of the 195-foot communications tower proposed by Scientel on the property east of the CyrusOne tower will interfere with and physically block communication networks attempting to access the CyrusOne tower from the east, and has the potential to cause frequency congestion in the area," CyrusOne claimed in court documents. "This interference with CyrusOne's wireless communications amounts to a post-hoc denial of CyrusOne's special-use permit." During a May 16 planning commission meeting for the City of Aurora, Richard Williams, an attorney representing Scientel said: "Rest assured, there's a lot of lawyers involved and a lot of paper being wasted and a lot of money being wasted right now. "Essentially, CyrusOne has three complaints, none of which we respectfully suggest are accurate."